Picture this bench in an entryway, a welcome place upon entering your home or peacefully situated in your garden under a lush tree where you can retreat. It has a natural and rustic vibe that is warm and inviting. It’s perfect for those spaces where you always want to offer a seat or place to rest but don’t necessarily have enough space for deep seating. This is the perfect solution. 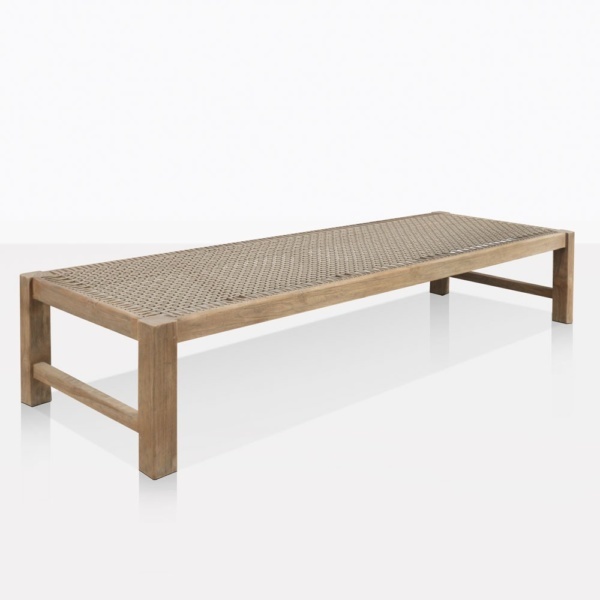 No cushion is needed because this bench is designed with a woven rope seat that has just the right amount of give for a comfortable seat. The rope has been meticulously woven together and through the teak frame. Not only does the Gazzoni Bench have more style than your typical bench, it is also wider and deep. Drape it with your favorite throw and add some decorative pillows for the perfect finishing touch. Picture this bench in an entryway, a welcome place upon entering your home or peacefully situated in your garden under a delicate tree where you can retreat. This bench really makes a statement. The unexpected detail of the moss green rope weaving in and out between the structured frame of the brown gray hues of the reclaimed teak wood creates a provincial tone that can only be expected to create a warm ambience of comfort. Grounded in tradition yet undoubtedly modern. 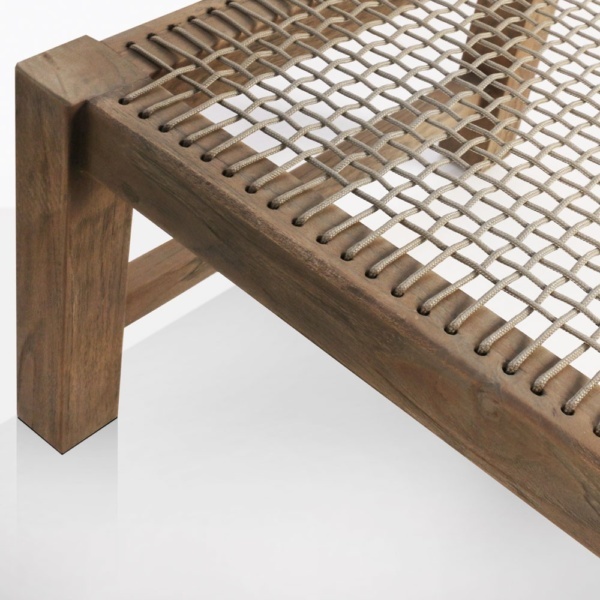 The Gazzoni Reclaimed Teak and Rope Bench has a solid framework of teak wood and seamlessly pulled together by rope, providing unexpected detail within the design. 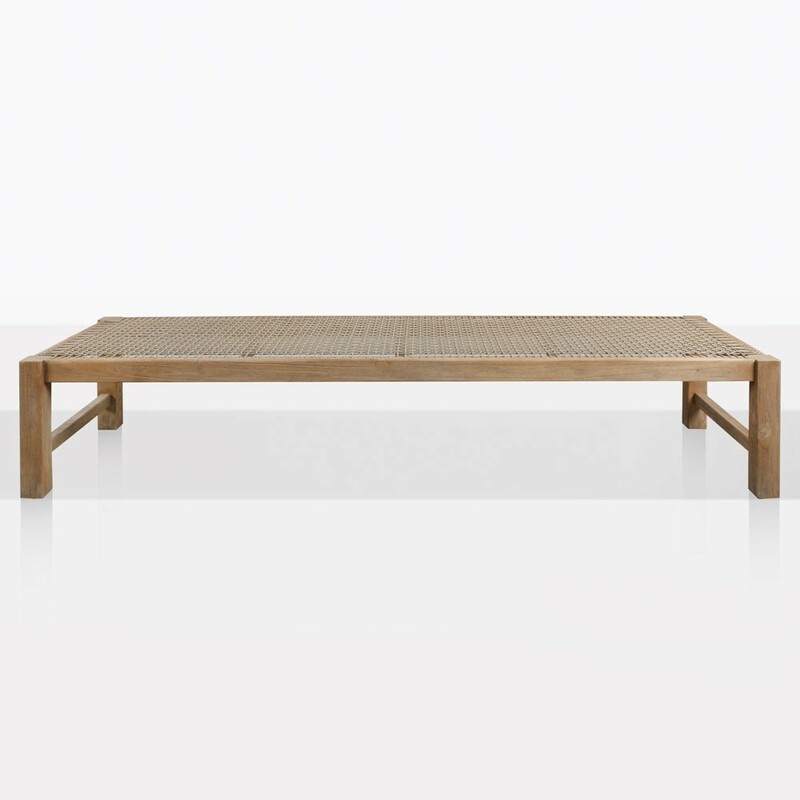 The Gazzoni Collection is one of Teak Warehouse’s most versatile and customizable sets. Add the bench along with the rest of the pieces in this collection like the center chair, the corner chair, and the ottoman to create a luxuriously comfortable space for you and your loved ones. Bring tradition and comfort onto a modern deck or add the bench to a contemporary entryway to optimize its utility. The Gazzoni bench can be used in casual and formal settings and is the perfect addition to any home. Let your creativity expand as you imagine the Gazzoni bench in various places around your home. The exceptional quality of the material and the smart design will certainly be a welcome addition to your home.